Social Surveys Africa offers the full strategy & research cycle. Our focus is on ensuring a clear logical chain from problem identification to intended impact, via appropriate methodology choice and quality data generation, quality control and analysis techniques. What do our Strategy & Research Services allow you to do? You have identified a social or institutional problem, but are not sure how to find out more about it? You have a clear research question and need a full-service research partner? You want to sample a difficult-to-identify population but don’t have a sampling frame? You are a research organisation looking for a specialised data collection service? You are planning or running a research project and want occasional strategic inputs or peer review of various components (TOR design, questionnaire, quality control protocol, fieldworker training, analysis plan, etc.)? You are doing a research project and want independent quality control? You have research findings but want to validate them with affected communities and stakeholders? You have completed data collection and want support with advanced data analysis, data visualisation and strategic findings interpretation? So much research is Rubbish in, Rubbish out. Often there is little transparency on how questions are designed, samples drawn, data collectors trained, sample and protocol adherence checked, and analysis validated. Research is still often managed as an ‘extractive industry’: data is mined as a ‘raw material’ by disempowered field ‘workers’, and the community which owns the information is hardly involved in value-add interpretation, validation or benefit. In contrast, our principles are Quality In > Quality Out and Nothing for us without us. In addition to designing and conducting full-cycle studies, we support the social research sector and evidence-based decision-makers with independent technical assistance. 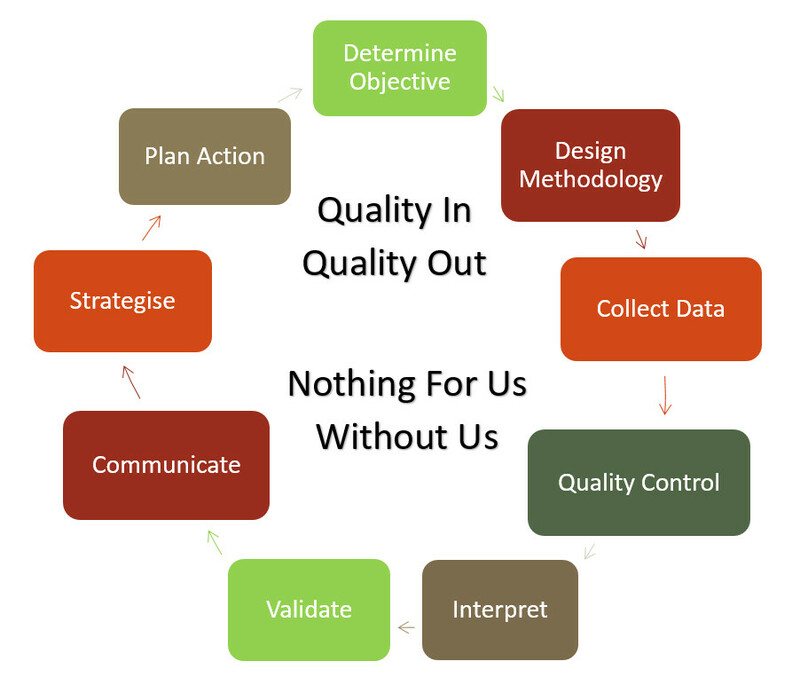 In addition to designing and conducting full cycle M&E studies (such as implementation and impact evaluations), we provide short-term support to organisations to quality control and upgrade their M&E systems, including Theory of Change development facilitation, indicator and monitoring system design, standardise and digitise monitoring data collection, and analyse existing monitoring data for strategic decision-making. Contact us to see if one of our M&E support packages is for you. We can provide support on site in Johannesburg or remotely anywhere on the African continent. Contact us to see if one of our short-term research support packages is for you. We can provide support on site in Johannesburg or remotely anywhere on the African continent. Data collection is an intensive and expensive exercise therefore it is important that the collected data is complete, reliable and usable. To achieve this one must employ an effective quality control protocol. We design quality control protocols based on the study objectives and the methodology employed to ensure that the collected data can be relied upon. We can design a quality protocol for you, check your quality control protocol or do quality control for you. Contact us to see if one of our quality control hourly packages is for you. We can provide support on site in Johannesburg or remotely anywhere on the African continent. Who can use our Strategy & Research Services? Companies, Civil Society Organisations & Government Departments and Municipalities wanting to make strategic, evidence-based decisions, improve their M&E systems and support their in-house research processes. Researchers wanting data collection services, technical support or interpretation assistance. Communities wanting to mobilise and engage with municipalities using reliable and up-to-date data about themselves. Who is using this already? Social Surveys Africa offers bespoke strategy and research services. For more information, contact info@socialsurveys.co.za or call 011 486 1025.